I've wanted to go to Aldo's for years now, but it's always seemed like one of those special occasion places that we couldn't quite afford. And, honestly, it still does. However - it's a place that deserves every bit of kudos it receives. I can't remember when I've had such a perfect meal. You know me - I love to criticize. But I could only find one teeny thing to complain about at Aldo's, and that is just a matter of my own personal taste. We were treated to a mini tour of Italy, starting off with a basket of fritto misto, or mixed fried seafood, with a marinara dip. 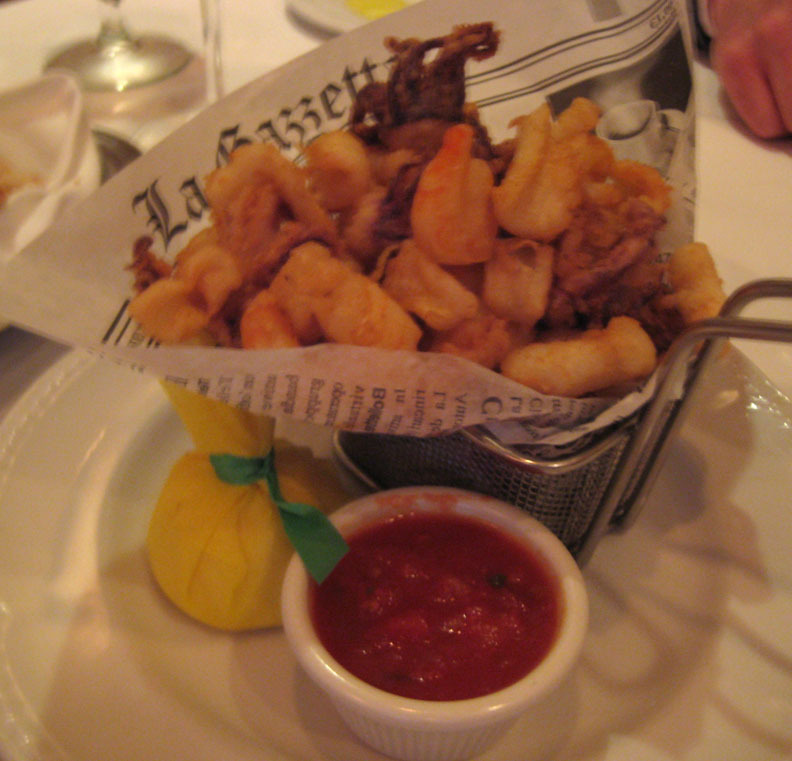 The cod, shrimp, and calamari were all crackling-crisp, and perfectly cooked. A great start to the meal. With the seafood, we drank a glass of the house Pinot Grigio. Panzanella salad came next. I loved that the greens were arugula, and that the tomato was juicy, red, and flavorful. And here's where my one criticism comes in: there was a little too much oregano for my tastes. I would have preferred basil. A trio of pasta was our third course, accompanied by a glass of a bone-dry red called Ruche. The pastas included fettuccine with lobster in a rosé sauce, porcini agnolotti in a black truffle butter, and a classic orecchiette with broccoli rabe and Italian sausage. The pastas were silky, the sauces were rich, and all were amazingly delicious. But I think I liked the agnolotti the best. The mushroom flavor was so woodsy, so intense, and a little went a long way. Our next course was the decadent Tournedos Rossini, prime filet mignon topped with foie gras, truffle and porcini sauce, and a side of four cheese risotto in a cheese cup. Wow. Generally, I don't care for filet because I often find it to be mealy/mushy in texture and livery rather than beefy in flavor. But this particular steak, which was cooked to a deep pink shade just shy of medium but not quite medium-rare, was outstanding. It had a nice salty crust and tasted like beef. And the texture was just marvelous. The sliver of foie gras on top was also perfectly cooked, browned on the outside and quivering pink inside. With this dish, we drank a glass of the house Amarone. Finally, we received a limoncello cocktail made with heavy cream, which was delicious, but impossible to drink after all of the rich food and wine that had come before. Our trio of desserts included a mini cannoli, a slice of feather-light tiramisu, and a small bit of intense flourless chocolate cake that didn't look too pretty on the plate, but wow. 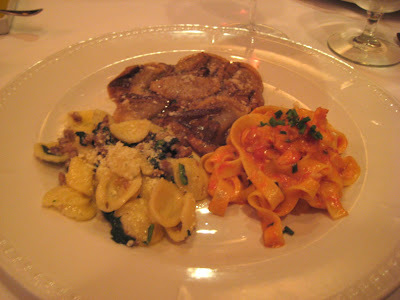 All of it was wow, particularly the pastas and the filet. The service was marvelous, too, formal but not stuffy, and our busboy was extremely attentive. Now I know where we need to go for anniversaries, holidays, and milestone birthdays - Aldo's. Much thanks to Sergio and Aldo Vitale for the wonderful meal. Your hospitality is exceptional, as is your food.